Bento for Kidlet: Happy Pi Day! Today is Pi day, 3/14! 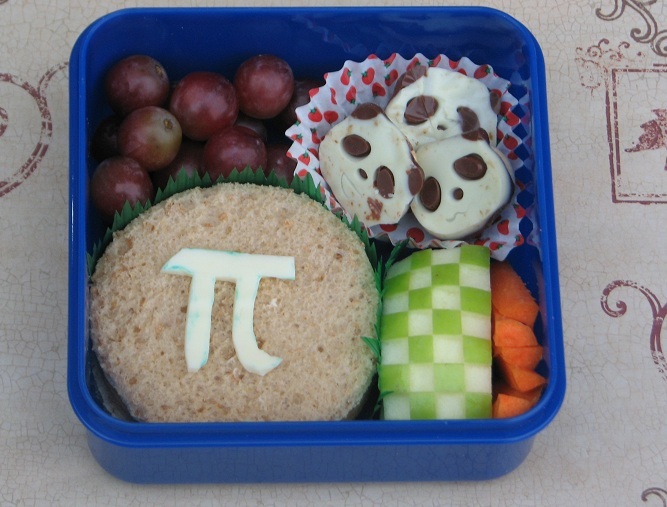 To celebrate Kidlet wore his Pi Shirt from Think Geek and I made him a special Pi bento! Packed in his new bento, Kidlet has a soy ham sandwich with a cheese Pi symbol. On the side are grapes, panda cookies, checkered apple, and carrots. Those Panda cookies are adorable!!! Did you make them, or did you buy them? Happy Pi day! tee hee! I wanted something Pi very badly, but the humor is lost of 8 and 5 year olds, maybe next year.